I am the President of CoquiTel, a small WISP whose goal to provide equal access to Internet and phone service to underserved areas of Puerto Rico. I have over 20 years of experience in Telecom specifically in Wireless/Cellular. Where are you located and where are you building your Village Telco? I am resident in Florida and Puerto Rico. I spend a equal amount of time in both locations currently. Is there currently mobile or landline telephone infrastructure there? There is a landline telephone infrastructure here which is in dire need of repair and upgrades. As far as cellular , there are towers in the area but the mountainous terrain provides a huge obstacle. Ths most cell phone users must travel 30 to 40 minutes to maintain a cell phone connection. If so, what makes WiFi wireless voice and data networking such an appealing alternative? breaks down resistance to new technology(Internet) by providing both a voice (the OLD) and data (the NEW) solution to the public. How big is your network currently? Network today has 83 Mesh Potatoes live with 4 new wireless POPs to expand the network. How big do you plan to make it? 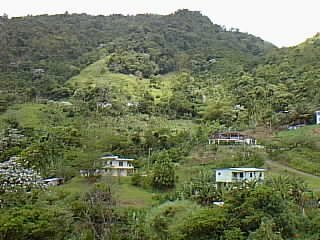 We plan to grow the network through most of the Central part of Puerto Rico which consists of about 10 target pueblos. Currently will have service in two pueblos. We are infilling the current pueblos and estimate to reach our first major goal (10 pueblos) by end of 2013.
Who are the biggest users of your network? Young or old? Women or men? Is it principally voice or data or both? We have a mixed bag. We currently have voice as the primary service. This will change immediately (next week or so) because I have accessed a microwave link with a large capacity. Currently we have pending orders of approximately 100 users because of the internet functionality. Of the pending users, most are women providing internet to their children or young residents (18 -29) that use social networking. Is yours a commercial operation? A non-profit? Cooperative? CoquiTel is a LLC which is legally a commercial operation but are interaction with the general public lends itself towards the Cooperative ideal. We are proud member of the Puerto Rico Bridge Initiative (PRBI), http://www.prbridgeinitiative.org. We work together with residents to create new jobs, connect residents with local business, provide training to local residents, and currently working with local municipality to provide a “backup 911 system” in the case of natural disasters and emergencies. What is the single biggest thing that would help you grow? Capital and funding. CoquiTel is funded primarily by myself and with assistance of volunteers who seek to provide equal access to the Internet and telephony to their fellow residents.